Open Performance Academy (OPA) is a research programme for young and established artist whose work engages, intersects with, discusses, draws upon, or is indebted to performance art. OPA organises lectures, workshops and try-out sessions, aims to create a platform for the exchange of ideas and the production of knowledges and provides artists with an opportunity to receive feedback on their work. 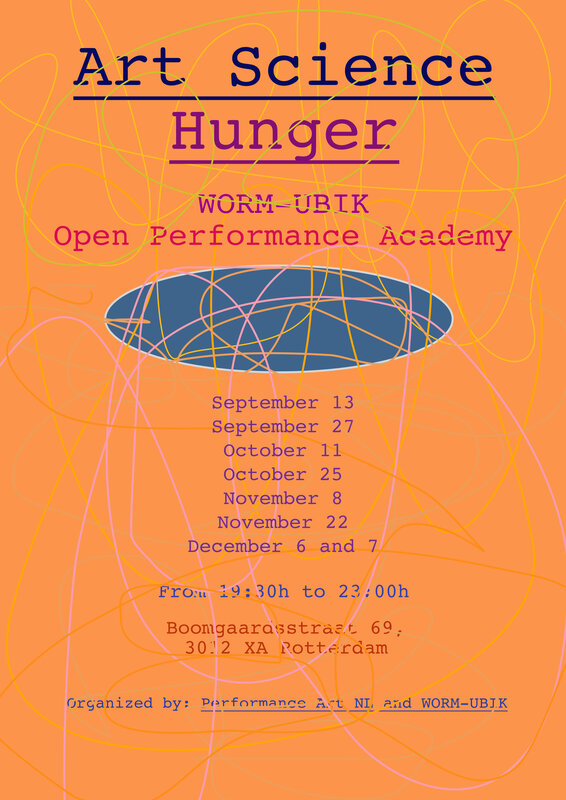 The Open Performance Academy joins forces with WORM UBIK Rotterdam! We want to let go of hard distinction, between theory-practice, body-mind and object-subject. And be open to other forms of knowledge production, within the artistic process. This is why we will issue the term ‘liquid knowledge’. Coming from the performance artist Marina Abramovich, she refers to the passing away of hard distinctions. Abramovich concurs with the idea that art can produce knowledge, beyond universal truth-pretense. In six meetings and two presentation days, ‘liquid knowledge’ is discussed from a surprising angle; the angle from the work process of artists and scientists. We do not strive to offer ready-made cultural information. Instead we focus on the ability of people to ask questions. By involving various disciplines at the event, WORM-UBIK offers a place for meeting and reflection on a theme that concerns us all. 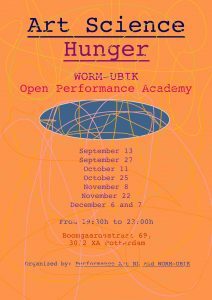 WORM-UBIK and OPA want to find new perspectives in the social debate about inclusiveness, by connecting art and science in a meaningful way.